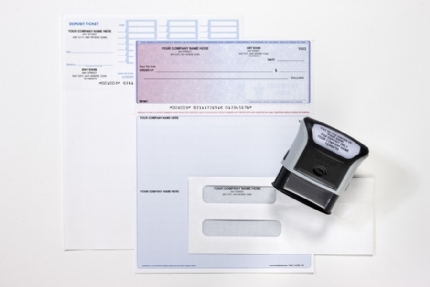 For larger companies or those who already know that they’re going to go through checks, envelopes, and deposit slips fast, the medium starter package is a great choice. With 450 checks, 200 envelopes, 150 deposit slips, and an endorsement stamp to make endorsing checks easier than ever, you’ll be able to get rolling fast with this medium starter package. It also includes your logo on the checks for free, so you can show off your business’s branding with every check you write. The medium starter package comes in 20 distinct colors and styles, so you can choose the one that best reflects the style of your business.